*Data taken from official Tau Kappa Epsilon honor cord provider website on 3/22/2013. Graduation is meant to celebrate not only students' academic success, but also their personal achievements and improvements throughout their educational experiences. Many college fraternities aim is to improve the minds and characters of the men who are members. After meeting the necessary requirements for membership in one of these societies, the fraternity brothers work to develop relationships with each other, as well as improve the world around them through service, philanthropy, and through their academic work. For their hard work and dedication to improvement, they are given the opportunity to don honor cords for their graduation ceremony in the colors associated with their fraternity, such as red and silver. Our red and silver braided honor cords are all synthetic, and will serve as a long lasting reminder to your graduate to continue on in the tradition of honor and service that he has begun in his college fraternity. By extending this opportunity to wear the red and silver honor cord at commencement exercises, you are publicly recognizing your graduate's particular success, and inspiring a sense of quiet pride and respect that will stay with him for years to come. Include this special token of both academic and personal achievement in your graduate's wardrobe for commencement, and he will shine as he receives additional honor for his educational development. 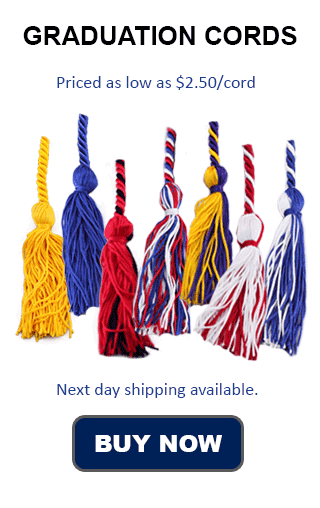 Tau Kappa Epsilon offers red and silver graduation cords through an online store, but while these cords are similar in quality, Honors Graduation offers the best possible prices. And, with our flat rate shipping option, you can get your cords fast, and cheap. Red and silver graduation cords will pop against the traditional black commencement robes, but can also look professional with many other robe shades. Watch your graduate glow with pride and gratitude as you present him with his red and silver honor cords for his commencement exercises. Whether you choose our red and silver braided cords, or red and silver double tied cords, your graduate will stand out for their success in their fraternity. Contact your local Tau Kappa Epsilon chapter for more information about how they traditionally wear their honor cords at graduation.